Dozens of relatives and friends of Cody Severight placed roses on the sidewalk at Winnipeg's Main Street and Sutherland Avenue to make the one-year anniversary of his death. A pile of roses now sits on a Winnipeg sidewalk at the spot where Cody Severight died one year ago. The 23-year-old was crossing Main Street near Sutherland Avenue on Oct. 10, 2017, when he was killed in a hit and run accident. 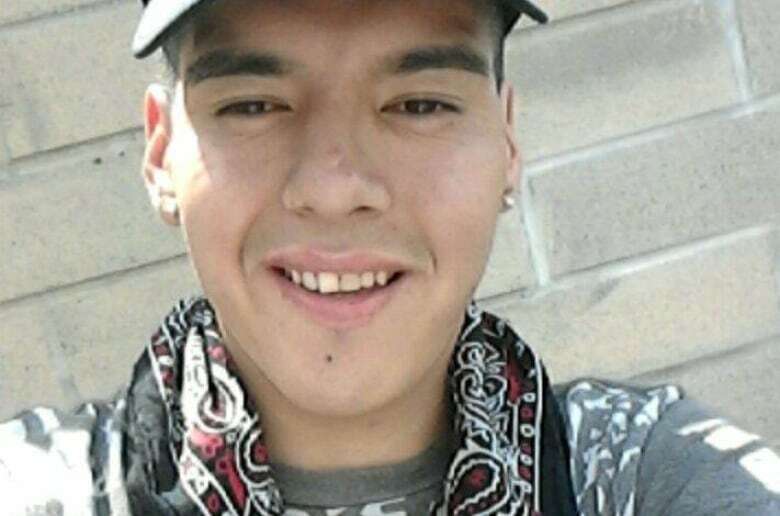 A former Winnipeg police officer who was off-duty at the time has been charged in connection with Severight's death. "We just don't want anyone to forget him, what happened here," Cindy Head said Wednesday night at a vigil for her nephew. More than 40 family members and friends gathered at the spot where Severight died. Many held brightly coloured signs with his picture and messages of love and longing. "A lot of us don't like coming this way at all.… It brings a lot of bad memories," said Severight's grandmother, Gloria Lebold. "We miss him every day. We love him." Still, she said it was worth the pain to honour her grandson with songs and ceremony at the spot where he died. "He shouldn't have had to die this way." Justin Holz, who was an off-duty Winnipeg police officer at the time of Severight's death, is charged with a number of impaired and dangerous driving offences, including failing to stop at the scene of an accident causing death. Winnipeg police confirmed in August that Holz is no longer with the force. He was put on administrative leave with pay after his arrest. In the past year, Severight's family has attended every one of Holz's court dates, hoping to catch a glimpse of the man accused in the death. However, his lawyer has appeared on his behalf each time. Holz, who is out on bail, will appear at his preliminary inquiry in the new year.